Track your team members’ activity across your organization. There are three periods you can choose from, ‘Last week’, ‘Last month’ and ‘Last three months’. 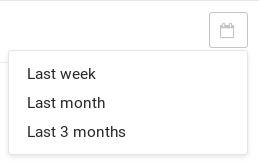 The default is ‘Last week’.